Selling Silver Superman Coins to Kitco is a secure and convenient way to sell silver coins online. We are always willing to buy one of the world’s most collectible and secure silver bullion coins. - Light frosting which enhances the engraving on this unique 1 oz Silver Superman Coin. - A stamped radial line pattern behind Superman’s S-Shield which creates a stunning light diffraction effect and another dynamic element on these 1 oz Silver Superman Coins. - Silver coin security features such as the precision radial line pattern, and the micro engraved textured maple leaf allow the Royal Canadian Mint to offer peace of mind to the Silver Superman Coin owner and potential buyer. - $5 CAD legal tender denomination which is one of the highest legal tender silver coin face values compared to other collectible 1 oz silver bullion coins in the silver bullion coin marketplace. *Multiples of 500 Silver Superman Coins are typically sold in authentic Superman Silver Coin Monster Boxes. **Multiples of 25 Silver Superman Coins are typically sold and shipped in authentic Superman Silver Coin Tubes. Why sell Silver Superman Coins to Kitco? Kitco is a trusted leader in the silver bullion coin and precious metals industry. 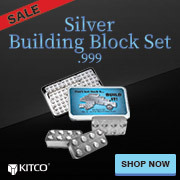 Silver and other physical precious metals sold to Kitco are recognized in silver bullion markets around the world. With our focus on silver bullion coins, you can benefit from our competitive silver coin prices and premiums within the silver bullion industry. We strive to make it easy for you to manage your tangible wealth. You can buy or sell silver and other precious metals using our convenient online store, or by contacting our team of highly trained precious metals specialists. Backed by our global information network, Kitco has proudly served our customers since 1977.